Fort De Soto was a coastal defense post on Mullet Key in Tampa Bay, Florida built during the Spanish-American War. 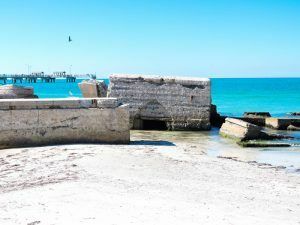 The area was first surveyed by U.S. Army Engineers in 1849 for possible use as a coastal defense area and the engineers recommended both Egmont and Mullet keys for military utilization, however, nothing would be built for years. When the Civil War broke out in 1861, there was no fortification, but Union troops set up a blockade between Mullet or Egmont keys which could be seen by troops perched atop the Egmont Key lighthouse. In 1898, when the United States became involved in a conflict in Cuba leading to the Spanish American War, citizens of Tampa to demanded military defenses for Tampa Bay. The Spanish-American War was short-lived ending in August 1898. However, plans for the fort were continued. 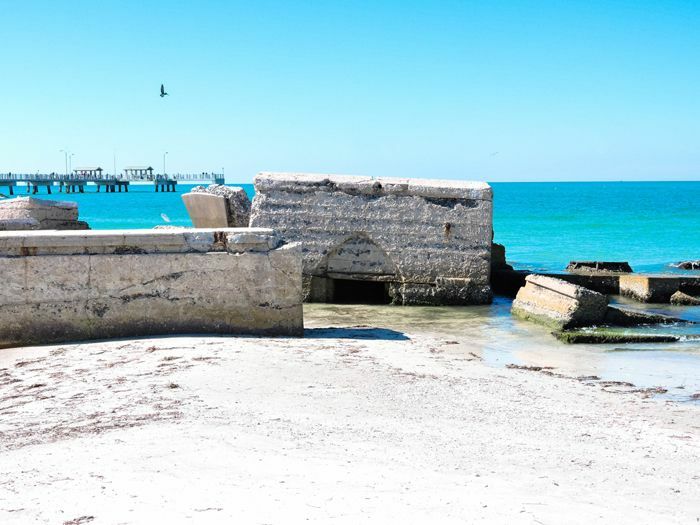 Construction on the Mullet Key post began in November 1898 and within the first six months, a 275-foot wharf extending into Tampa Bay, a mess hall, office, stable and workers quarters had been built. A narrow-gauge railway ran between the wharf and a construction plant with a spur line running to the future battery site. The post was first called the Mullet Key Military Reservation and was a sub-post of Fort Dade on neighboring Egmont Key. In April 1900, the post was renamed Fort De Soto after the Spanish explorer Hernando De Soto. The first mortar battery was completed in May 1900. More buildings were constructed between 1900 and 1906 which included a 100-foot long barrack, hospital, guardhouse, a shop for blacksmiths and carpenters, a bakehouse, and a storehouse. When construction was complete, the fort included 29 buildings, all of which were of wood construction with slate roofs. More batteries were built in the next few years. At its peak, the fort was garrisoned by 125 troops. In 1909, the troops of Fort De Soto were transferred to Fort Morgan, Alabama, and the fort became inactive with just a caretaker detachment remaining. In 1917, during World War I, the fort was regarrisoned but the detachment was small, including 22 privates, two noncommissioned officers, and two officers. On May 25, 1923, both Fort De Soto and Fort Dade were abandoned, leaving one caretaker at each post. Many storms took their toll on the fort but by October 1932, there were still 26 of the original 29 post buildings standing. In October of that year, Battery Bigelow collapsed and was swallowed by the Gulf of Mexico. In September 1938, the Pinellas County Board of County Commissioners bought a 271-acre tract on Mullet Key for $12,500. Two years later, however, the War Department made a decision to turn Mullet Key into a bombing range. The tract was then sold back to the federal government for $18,404 and it returned to military status as a subpost of MacDill Field in June 1941. In August 1948, after the end of World War II, Mullet Key was sold back to Pinellas County for $26,495.24. The land included the original 271 acres plus an additional 613 acres. By this time the military structures had been removed or destroyed. In 1962, the Pinellas Bayway toll road was completed to the mainland, enabling island visitors to arrive by car and in December of that year, the Fort De Soto Park opened. In 1977, the Fort De Soto batteries were placed on the National Register of Historic Places. 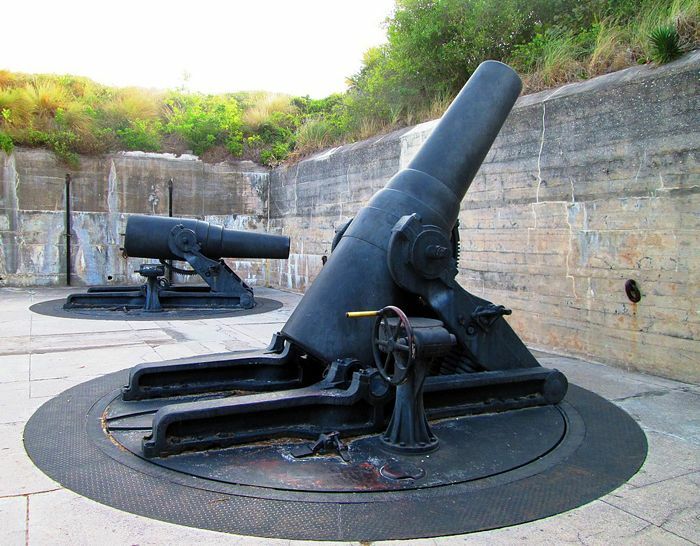 The four 12-inch mortars and two 6-inch Armstrong guns at Fort DeSoto are the only weapons of their type remaining in the United States. In 1999, the quartermaster storehouse was reconstructed to become the Quartermaster Storehouse Museum. Fort De Soto was never the site of any battles and the weapons of both Forts De Soto and Dade were never fired in combat. Today the park offers fishing, picnic areas, swimming, a boat ramp, camping and hiking trails. A ferry is available for visitors to travel to Fort Dade on Egmont Key.